We love Port de Soller, this is our sixth time there and our third stay at this house. 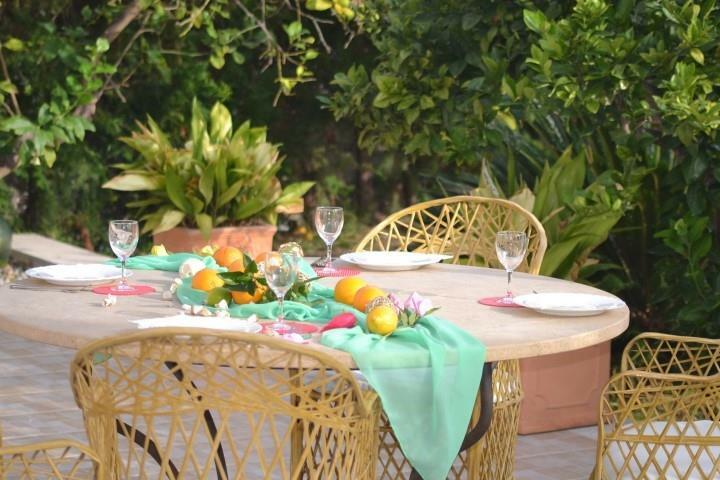 We enjoy sitting on the terrace enjoying the views of the mountains and the lemon trees in the garden. The proximity to the sea is also an advantage. However, we were a little disappointed by the house when we arrived this year. Our first impression was that the barbecue had not been cleaned from the previous guests and was full of ashes. There was a broken window at the front of the house. The kitchen cupboards had grease marks from previous guests. Only one of the sun loungers could be used as the other three were torn. The bedding and towels are quite old and ready for replacing. Still no WiFi. We love this house and it’s position but it could be made so much better. We holidayed with another couple and this property suited our needs perfectly. Separate sleeping areas with good quality on-suite facilities combined with a huge very well-equiped kitchen- diner and lounge area as well as a separate quiet reception area, excellent large patio and garden full of citrus trees. The House is located just minutes away from a sandy beach, restaurants, Spar Shop and pleasant bars overlooking the beautiful bay. We recently stayed for 5 nights at this delightful property in Port de Soller. The house was very well appointed, with just about everything you could possibly require, including umbrellas and a chair for the beach, which saved quite a few Euros over the 5 days. The 2 downstairs bedrooms are a little dark as the blinds are usually shut to keep out the road noise, but you are only sleeping there after all. The 2 bathrooms are very nice, with lovely showers. The rest of the house is clean, spacious and comfortable. The air-conditioning is very nice to have. Previous posters have mentioned the lack of wifi, but we can assure you it was possible to pick up a signal - if you use a bit of lateral thinking ! Virtually every bar, cafe and restaurant has free wifi, and the beach and promenade is just 2-3 minutes walk from the house. One bar though, Mini Bar, has a sign saying " No Wifi - Try to talk to each other" - Good point. We would recommend the restaurant across the road, Campo Sol, as well as Las Olas, on the promenade, and Es Reco on the beach. There is a Spar shop very close by on the promenade, and they make up fresh rolls while you wait, You can buy most things there if self-catering, but not sure where you would find a butchers. If you are staying for a longer period I would think a trip to Soller would be the answer. You could travel up by Tram (€6.00 each) and return by taxi which is only €8.00 total. The agent, Melanie, was very helpful and efficient with the booking, and even arranged taxis for us in both directions. Both of which were very punctual. Would recommend booking from Palma airport as the queues can be very lengthy in high season. We would be happy to stay at this property again. We have just returned from four weeks holiday in this lovely house. It has beautiful views of the mountains, a large terrace with sun beds, umbrella, table and chairs, a brick built barbecue and has a garden with orange and lemon trees. It was perfect for my husband who has limited mobility with one step onto the terrace and a downstairs bedroom and bathroom. The upstairs is perfect for a couple with its own bedroom and bathroom. The restaurant across the road is traditionally Spanish, it is used for children's birthday parties and events and we did not have any problems with this. The road outside is busy and traffic noise can be heard in the downstairs bedrooms. We found the mattresses to be a little too firm for our liking and wifi would have been an advantage. Would we return? Definately, loved it!